Discover Colorado River Oasis, where great service, immaculate facilities and surprising affordability combine to create the perfect Bullhead City, AZ Resort & RV Park destination. We offer a wide array of amenities and activities to suit every interest. We know you have a choice of resorts & RV parks near Bullhead City, AZ & Laughlin, NV so we've created the most welcoming & beautiful Colorado River RV park, resort & park model rental experience you'll find. 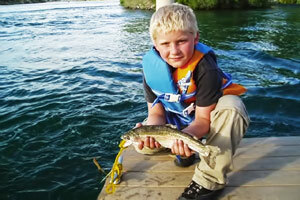 See why so many of our guests return year after year to our Colorado River waterfront RV park & lodging. Our amenities ensure a comfortable Bullhead City, AZ & Laughlin, NV vacation: direct Colorado River access with sandy beach, boat launch ramp & dock, swimming lagoon, sparkling pool & spa, huge waterfront clubhouse, gym, modern laundry facilities, immaculate restrooms & showers and much more. 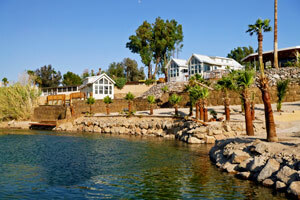 We offer excellent RV sites, kitchenettes and park model rentals on the Colorado River. You won't find a more comfortable or welcoming Bullhead City resort, RV park & vacation rental spot. Come Join the Colorado River RVing Fun! At Colorado River Oasis, our guests really know how to have fun. Whether you prefer an exciting day of boating, fishing, or jet skiing on the river, or a relaxing dip in our pool and spa, you'll love our Bullhead City resort & RV Park on the Colorado River. With our immaculate facilities and Colorado Riverfront location, Bullhead City RV camping at Colorado River Oasis is the best on the river. Once you visit, you'll see what's so special about our Bullhead City, AZ RV Park and why so many of our guests return here for their Colorado River vacation year after year. Enjoy Colorado River recreation — boating, water skiing, jet skiing, tubing, kayaking & fishing and events like the Laughlin River Run, the Colorado River Regatta and the Bullhead City Regatta. Take a dip in our pool & whirlpool spa, work out in our fitness room or enjoy the TV in our clubhouse. Come join in our welcoming snowbird community and participate in the many community events in our clubhouse overlooking the Colorado River. Whatever your interests, Colorado River Oasis Resort, RV Park & Bullhead City waterfront lodging will ensure that your Colorado River vacation will be a memorable one. Be sure to come visit us soon! Watch The Aerial Tour Of Colorado River Oasis!